One Achom Degio of Arunachal’s junior girls’ football team has made it to the list of 35 probable players who would represent India in the upcoming South Asian Football Federation’s (SAFF) U-18 Women’s Football Championship to be held in Bhutan from September 27 next. 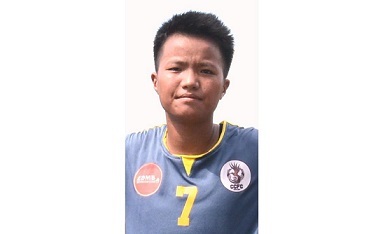 Achom has been selected on the basis of her emphatic performance in the recently held Junior Girls National Football Championship in Goa, a press release from the Arunachal Pradesh Football Association (APFA) informed. Ajay said the hard work put in by the coaches, association, team officials and Achom herself has finally paid off. Achom currently plays for CCFC, the same club, where she started her career in club football. Takum also congratulated junior girls’ football team head coach Kipa Bharat and said he has been working extremely hard to nourish such talents of the State and has been the major force behind the success of Achom and many others. “Achom was also a part of the U-14 Indian National Camp in the year 2014; however, she could not make it to the final squad. We are hoping that this time she gets there,” Takum said. Daughter of Takyang and Mejin Degio, Achom is currently pursuing her Bachelor of Physical Education from Lakshmibai National Institute of Physical Education, NERC in Guwahati.